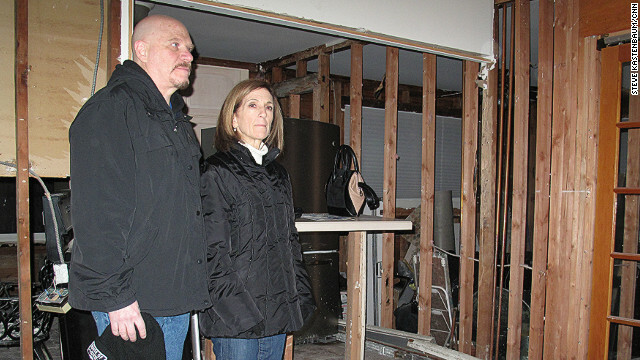 Fran and Steve Adelson gutted their home a few days after Sandy flooded itr. They are still waiting for a check from the National Flood Insurance Program. (CNN) - As Congress votes on proposed Superstorm Sandy relief funds this week, Fran Adelson is wondering whether she will ever get a check from the National Flood Insurance Program. Two and a half months after Sandy pummeled the Northeast, thousands of homeowners like Adelson are still waiting for insurance payments. [2:42] “I don’t think any of us, anybody certainly in any flood area, anybody that has flood insurance would have ever expected to be in a position where they had to fight for every dime, where they were constantly calling their insurance companies and where the money is just taking so long to get to people,” said Adelson. The Long Beach, NY resident says her story is not unique.